Glad you enjoy him mate! cheers man, whats your record with the nif looking like? Not bad. ALL WL and Rivals. How many on here have him in their teams? not many but no reason not to have a thread. But the NIF does the same right? 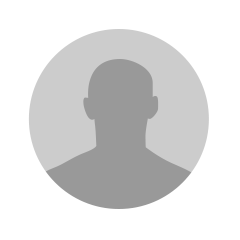 Can you give us a good review? I have contemplated going all in for this card when I have enough coins. there Is nothing bad about the card. I've had 6 goals in one game with him. trying to fit the NIF with Ibra and Messi on the team. But... love CR7. He is my favorite. I literally toy with people in the box and chip it a few feet over to CR7 and he heads it in. So fun. Should we make a special thread if we have the OTW or CL version? Hahaha, was just messing around. Would love to get his TOTY someday. His NIF was immense. Had him at the start of the game. If I could get him in my current team, it'd be the dream. I think any goal to game ratio is possible depending on how you play and the level you are at. some of those may purposely be in a lower rival divison, who knows? IMHO everyone should post their Skill level/Div when they post their achievements and player reviews. Caved in and got him and as expected he is a beast. Beat some guy 3-0 (he rage quit in the 37th min) who finished on 26 wins last week, Ronaldo Hattrick. The only thing which I’m struggling with is his green power shots, keep hitting the bar and post. Too much power is going on them lol. Most fun player in the game... No others have him covered most notably Cruyff. Did want him in my team, but i'd have to sell TOTY De Gea, Pogba & wait another 2-3 weeks... & then bench Ibra, so overall it's not worth it. may eventually get him as i've never had a Ronaldo in FUT, but Ibra is doing to well to take out atm. Don't know how you guys got those stats (squad battles smh) . It's impossible to have a lead where they don't rage quit. Every time i score instant rage quit. It's boring. Your team would scare the **** out of most people. I finally bought toty cr7 yesterday after 4 months of trading (bought 12k fp on release). Played 5 games in DR...7 goals and 5 assists so far. I had prime Raul before, but cr7 is really on another level, absolutely unstoppable. Toty Mbappè will be the next! 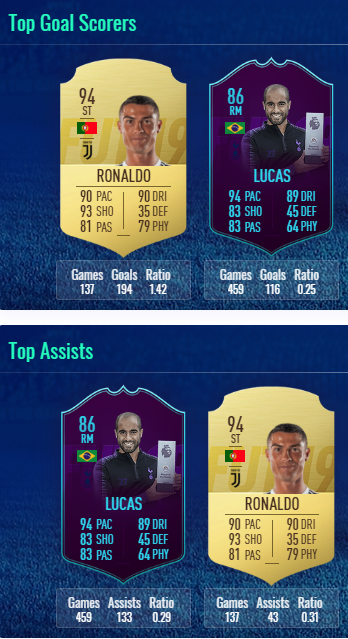 TOTY Ronaldo? Boring fest... I would love to have nif ronaldo in my team..but the low balance though.. I'm not a very good player (gold2/3)...but Toty CR7 is ridiculous....he's carrying me in WL with 2gpg 2apg ratio. Ps. Please take it easy on me when we play, I'm fragile & you may hurt my feelings. Depends if you have a stacked team. Last year I had r96 in a pov Bpl team to start with and was 2 gpg pretty much all the way with him, so it’s possible. Also, there’s some games where you’ll win them 4-3 or 5-4, they add up as well.